"Lifetime of a Flower" ("Hana no Shougai") is a novel by Seiichi Funahashi (designated a "number one" honorary citizen of Hikone) depicting the turbulent life of Hikone's Naosuke Ii, who made the definitive decision to end Japan's seclusion from the outer world in the 19th century. The novel's release created an impact on many, and it was subsequently turned into a film, a play, and a highly-praised NHK TV Taiga Drama that brought about a "Lifetime of a Flower" boom. This plaque was placed here as a memorial to this event on October 25th, 1964. 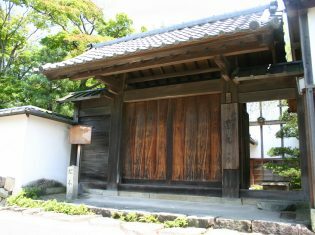 The square, central stone is intended to represent Naosuke Ii, while the low stones on either side are meant to be his retainer, Shuzen Nagano, and Taka Murayama, a former geisha a female spy. The shimmering sand is meant to be snow, representing the swirling conflict with which "Lifetime of a Flower" is full.